The Ariadne Forecast is a community created resource. Ariadne is a flexible network of more than 550 funders in 25 countries. Ariadne participants and other friends of the network, were asked six questions about trends in their field for 2016. More than 140 funders, including, for the first time, members of the Assifero and ACRI networks in Italy, and Admical in France, submitted written answers. In Belgium, France, The Netherlands, Hungary and the UK, 20 grant-makers of differing seniority and interests were interviewed at greater length. In January and early February, we held forecast meetings for funders in Brussels, Paris, London and The Hague to discuss and add to the findings. At each of those meetings 2 senior meteorologists, who have deep experience of the sector, were invited to assess the trends uncovered so far and add their judgment. These meetings and the discussion at them were private, but the final forecast is publicly available for all, as a reflection on the sector. 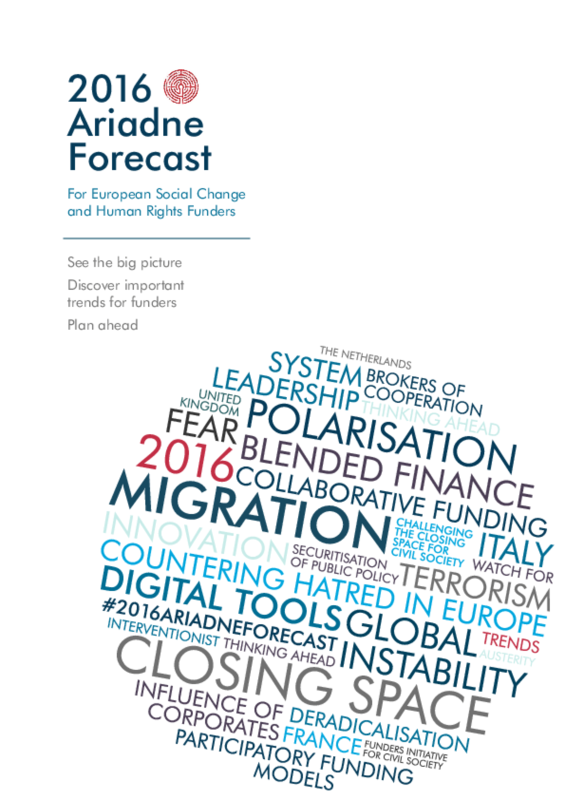 From this input the Ariadne team has distilled an overall forecast, looking at trends globally, as well as at European and national levels. This year we are delighted to add France and Italy to the UK and The Netherlands in the country analyses. Copyright 2016 ARIADNE, Global Dialogue.